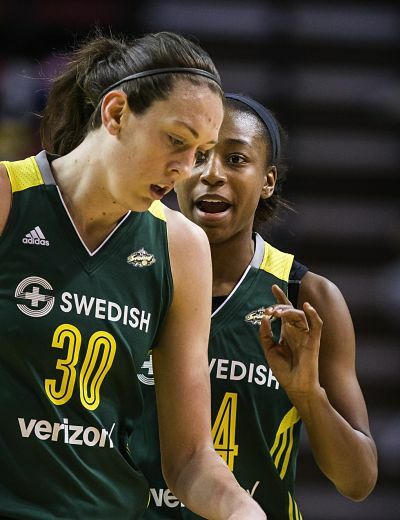 Though the Storm is struggling as a whole, starters Breanna Stewart and Jewell Loyd have remained consistent scorers. Photo by Dean Rutz/The Seattle Times. What a difference two weeks make. After winning four of its first five games, Seattle dropped to .500 on Tuesday after an overtime loss to Atlanta. It was the Storm’s third consecutive loss, all three by eight points or less. And in all three, the now 5-5 Storm were in a position to win. 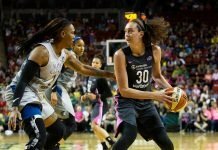 Seattle entered the fourth quarter in Indiana on June 9 up by five, were tied with five minutes to play, and ultimately were a missed Sue Bird three-pointer at the horn from sending the game to overtime. Two days later in New York, the Storm again took a lead into the fourth, and held a one-point edge with less than four minutes to play before a series of costly turnovers put the game out of reach in the closing moments. The first game of the homestand that followed brought a different brand of frustration, as the Storm mounted a furious comeback late Tuesday to erase a 10-point deficit, only for the final shot in regulation to fall short, and the team as a whole to fall short in overtime. Combined, about a dozen possessions, give or take, are the difference between 5-5 and 8-2. It is a surprising turnaround for a team that ended May on a four-game winning streak. Head coach Jenny Boucek pointed to the team’s defense as the biggest difference not just in the losing streak, but the stretch of the last five games. The numbers certainly back that up. After holding opponents to an average of just 76.4 points per game over their 4-1 start — a figure that would be good enough for second in the league behind Minnesota — Seattle has allowed 88.8 on average over the last five. That ranks worst in the WNBA for the season. And after allowing no more than 82 points in the first five games, Storm have eclipsed that mark four times, and passed 90 points three times. That problem is magnified by the team’s consistent performance on the offensive end, with Seattle scoring almost the same number of points in the first five games (417) as the last five (414); an 83-point-per-game average. 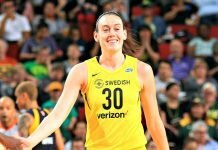 Both Jewell Loyd and Breanna Stewart are in the top-10 in the league in scoring, averaging 20 and 17 points per game, respectively. 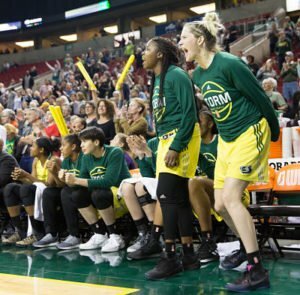 The Seattle bench cheers on teammates late in the match up with Atlanta last week. Photo by Neil Enns/Storm Photos. But to an extent, a lack of offensive production from the bench and a reliance on that starting five has also hamstrung the team. With draft picks Alexis Peterson and Lanay Montgomery seeing little action, and Kaleena Mosqueda-Lewis out as she recovers from a right knee scope, Boucek has four veteran options to turn to outside of the starting lineup. 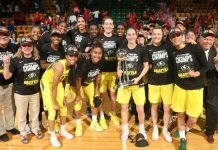 Those players have shown flashes – notably Ramu Tokashiki’s 14-point effort in the season-opener in Los Angeles (albeit in her lone start), and Sami Whitcomb’s 22-point performance on 6-of-8 shooting in the team’s come-from-behind win over New York. The unit’s best outing came in a 94-70 win over the Fever, as all six available bench players combined for 29 points. But the most the bench has scored since that outing is 18. Most notably, the second unit was held to just three points, all from Tokashiki, in the 83-80 loss to Indiana. Expected to be a key contributor in the post, offseason acquisition Carolyn Swords is on pace to post career lows across all major statistical categories. After starting all 34 games, and playing just over 17 minutes a night last season for the Liberty, the 6-foot-6 center is averaging 1.6 points and 1.5 rebounds in eight minutes a night off the bench this season. Seattle will try to get back over .500 on Sunday, against perhaps the best possible foe: the winless San Antonio Stars.